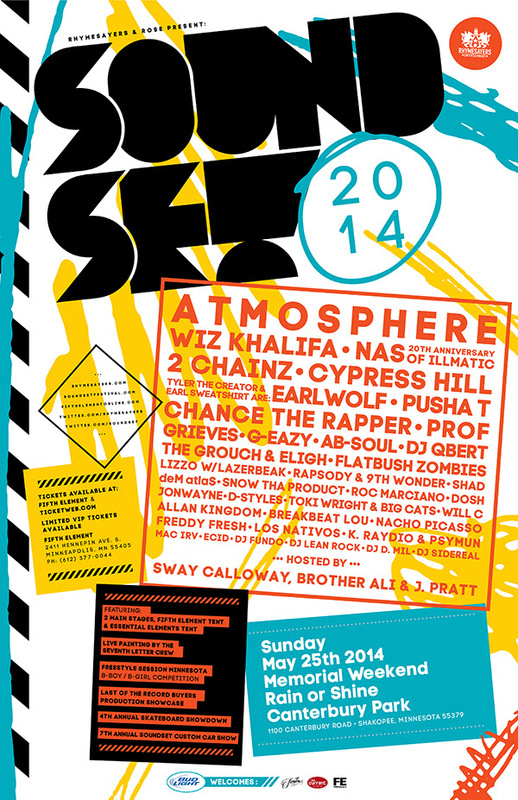 Rhymesayers Entertainment and Rose Presents announce the 7th Annual Soundset Festival: your official Midwest kick-off of the summer, with nine hours of the best Hip Hop music in one day. It all goes down at Canterbury Park in Shakopee, MN on Sunday May 25th, 2014 (rain or shine). Atmosphere, Wiz Khalifa, NAS (20th Anniversary of Illmatic), 2 Chainz, Cypress Hill, EarlWolf (Tyler The Creator & Earl Sweatshirt), Pusha T, Chance The Rapper, Prof, Grieves, G-Eazy, Ab-Soul, DJ QBert, The Grouch & Eligh, Flatbush Zombies, Lizzo with Lazerbeak, Rapsody & 9th Wonder, Shad, deM atlaS, Snow Tha Product, Roc Marciano, Dosh, Jonwayne, D-Styles, Toki Wright & Big Cats, Will C, Allan Kingdom, Breakbeat Lou, Nacho Picasso, Freddy Fresh, Los Nativos, K.Raydio & Psymun, Mac Irv, Ecid, DJ Fundo, DJ Lean Rock, DJ D. Mil, DJ Sidereal. Hosted by Sway Calloway, Brother Ali & J.Pratt. Tickets go on sale to the general public on Saturday, March 8th, 2014 at 11 AM (CST) to the general public through www.ticketweb.com and Fifth Element. General admission tickets are $55 ($3 facility fee and parking are included in ticket price). VIP options for $125 ($3 facility fee and parking are both included in ticket price) are also available! This year, Soundset boasts a full day of two Main Stages and the Fifth Element stage delivering over 45 artists performing nine hours of diverse music, plus the Essential Elements tent featuring Freestyle Session Minnesota B-Boy/B-Girl competition, hosted by J.Pratt. In addition, The Seventh Letter Crew return to bring some of the world’s most talented visual artists, who will be live painting all day. Also returning, will be the 4th annual Skateboard Showdown presented by Familia, the 7th annual Soundset Custom Car Show, and a special Last of the Record Buyers production showcase featuring a live production set by Dosh.